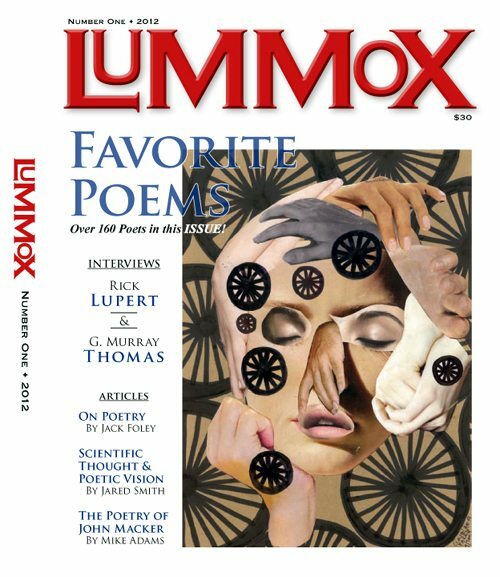 Lummox Press announces the inaugural issue of a new annual magazine/anthology entitled LUMMOX, due out in mid-Nov. of this year. The first issue has the work of over 160 poets in it and features SPECIAL SPOTLIGHTS on poetry from all over the US and beyond! 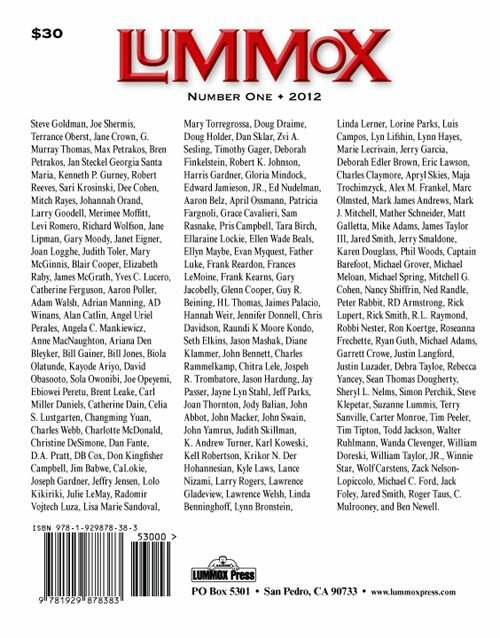 Guest Editors Georgia Santa Maria (ABQ, NM), Jane Lipman (Santa Fe, NM), Biola Olatunde (Nigeria), Don Kingfisher Campbell (San Gabriel Valley, CA), Doug Holder (Boston area), Ed Nudelman (Northeast Poets), Jaimes Palacio (OC poets), Jane Crown (International), Marie Lecrivain (LA Poets), Mike Adams (Colorado area) and Ryan Guth (Mid-South) represent their areas with gusto! In addition to all this, the poetry from all over the US, Canada and the world is represented by both known and unknown poets. There are essays on poetry; reviews of poetry; 2 interviews with a couple of SoCal movers and shakers: G. Murray Thomas & Rick Lupert! There is also a Tributes section to fallen poets. On top of all this there is also artwork by Robert Branaman, Mark Hartenbach, Claudio Parentela, Norman Olson, James McGrath and Raindog. All this for just $25 (USA) when you buy direct from the Lummox Press website! This entry was posted in RD Armstrong and tagged Lummox, Lummox Press, Poetry, RD Armstrong by Monsieur K.. Bookmark the permalink.